It was date night - kind of. 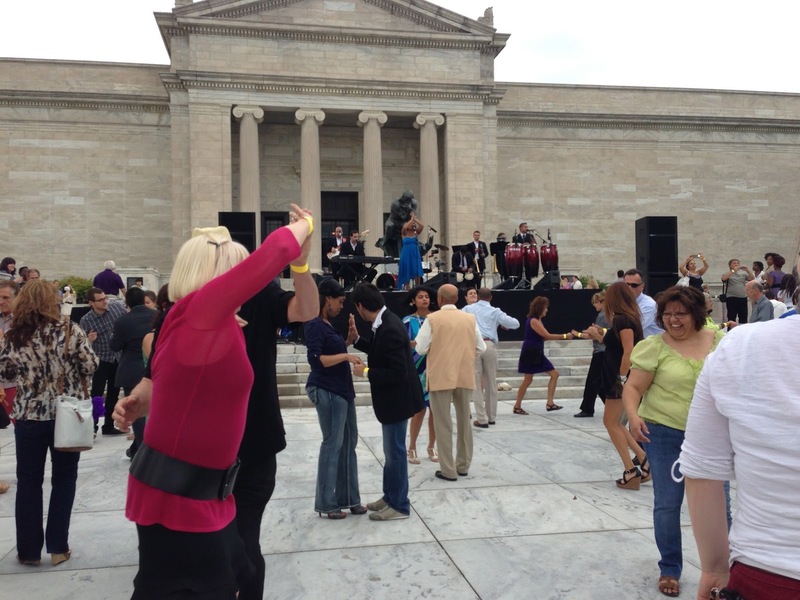 We did go to the Cleveland Museum of Art for their first Friday of the month party. This one was Latin flavoured: Mix: Caliente. Just another opportunity to look at art, drink and dance. Though I don't dance - and certainly not salsa style. .....though they were giving lessons. It was a muggy night - threatening to rain. My bad leg had been hurting so much all day I was almost praying for it to finally open up....the heavens, not my femur. Usually it's not the act of rain (or snow) that relieves the pain in my leg - just the arrival of the low front. Yes, that usually means rain or snow, but not always. This time, I had to wait for the actual rain. Or possibly the pain ceased due to the 2400 mg of ibuprofen I took. The music was well done. People seemed to be into the dancing.....there were even a few ringers it seemed. Or at least folks who knew what they were doing with the Latin beat. There wasn't much new in the art world going on at the museum. Most the exhibits were the same as they were a month ago - the last time we were there. However they did get rid of the Rodin gallery - hopefully only a temporary thing, as I love it. Currently in its place is a sculpture of tools. What you can't tell from this shot (which was verboten), but you can walk through the middle of the pointy saws and such. I thought to myself - aloud - "worst place ever to have a seizure". It was a nice evening. A decent, but not overwhelmingly, sized crowd. And since it was caliente, we went out afterward for fair to middling Mexican food. The tool sculpture is wicked awesome! I have this fear that the tool sculpture is either imploding and going to poke someone seriously, or exploding and poking a lot of people seriously. Either way, someone is going to get poked in a bad way.